The last time I got a massage, it was at place in a nondescript office strip where the reception area was conventional and pretty much all business. Except for the small water fountain on a table in one corner. The sight and sound of falling water seemed to take the hard edges off of the place and created a calming and relaxing atmosphere right from the start. The message of the water fountain stayed in my mind much longer than the massage stayed in my body. It turns out that indoor water fountains are more popular and more accessible that I had imagined. A company called Indoor Fountain Pros sells indoor fountains in hundreds of different shapes and styles ranging from small table fountains to large floor and wall-mounted installations. 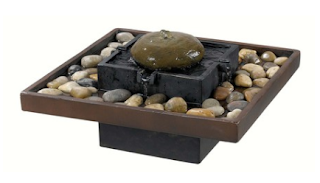 Many of the fountains are made to showcase natural materials such as slate or marble. Others feature metal backgrounds or artistic designs and reproductions of familiar artwork such as Van Gogh’s Starry Night. Prices start at about $110 for the Bliss tabletop fountain shown here and go up to about $10,000 for a 16-foot custom wall installation. You can browse the full catalog and compare models and designs of indoor water fountains at the Indoor Fountain Pros website.